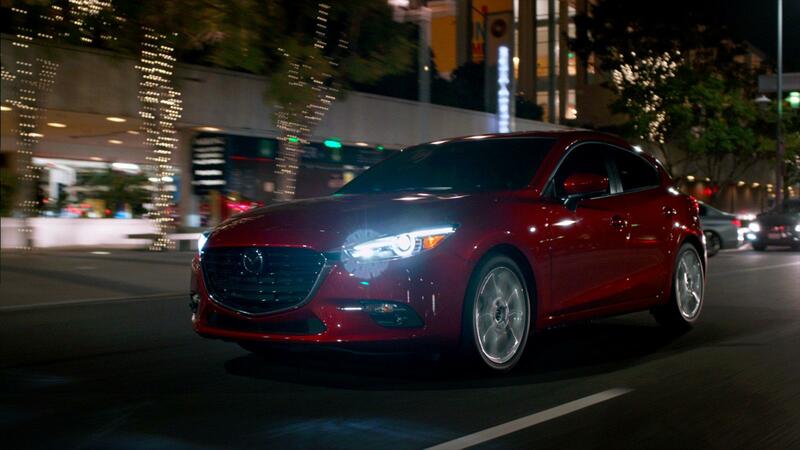 The 2017 Mazda3 is the fourth model year of what is now the third-generation of this stylish compact car, and that means this model year benefits from a mid-cycle facelift. It's not easy right now for anything in the auto market that's not a truck, SUV or crossover, so sedans, hatches, and coupes of all shapes, sizes and brands have to really keep on top of their game to stay relevant. There are a number of ways this can be achieved, which can include offering more standard kit, better fuel economy, more entertaining performance and making them increasingly attractive. It appears Mazda hasn't bothered trying to choose any particular one of those routes to go down with the latest Mazda3, so instead, it's decided to make it better than its rivals in just about every area. The mid-cycle refreshing of the 2017 Mazda3 sees it benefitting from a new face and an upgraded interior, even though it was already pretty fantastic to start off with. The aesthetic changes really are very subtle at the front, with the lower half of the front fascia getting the most notable enhancements. The fog light assembly has been most noticeably revised with a smaller fog light and a turn lamp unit embellished with a chrome-colored fin that attracts the eyes towards the wider, deeper grille. The nose of the Mazda gets pushed up a bit higher, and the Mazda badge is now more deeply set into the grille than it was last year. Although the overall look and feel of the interior remains as good as ever and completely in tune with the rest of the current Mazda range, there have been a few tweaks here and there to freshen things up a little. The steering wheel gets updated and the manual handbrake has been swapped for an electronic lever. The 2017 Mazda3 also gets a new driver-focused cockpit, which sees the pedals and manual controls now being arranged symmetrically around the driver's centerline, and a head-up display is now available showing current speed, turn-by-turn directions and other vital information. There are three great trim levels in the 2017 Mazda3 lineup, which begin with the entry level GX and then go to the mid-range GS and finally the top-specification GT model. Although there are only three trims there are actually two different engines for you to consider. The engine you get in the base GX and the GS is a four-cylinder 2.0-litre SKYACTIV-G DOHC developing a pretty useful 155 horsepower and 150 lb.-ft. of torque. If you would like more power than the 2.0-liter unit offers you'll have to go to the GT and its 2.5-litre four-pot that produces 184 horsepower and 185 lb.-ft. of torque. A six-speed automatic transmission is standard across all three available trims, but you do have the option of a six-speed automatic with all three and the GT's auto also comes with paddle shifters. If you want the best fuel economy on offer here, it's no surprise the 2.0-litre engine is the better choice. With the manual transmission, it delivers ratings of 8.5 L/100 km in the city and 6.2 L/100 km on the highway, while the automatic gets 8.4 L/100 km in the city and 6.4 L/100 km on the highway.